Combine cheeses in a food processor. Add eggs, lemon juice, sugar, salt and pepper and pulse to combine. Add almonds and basil leaves and pulse to incorporate. 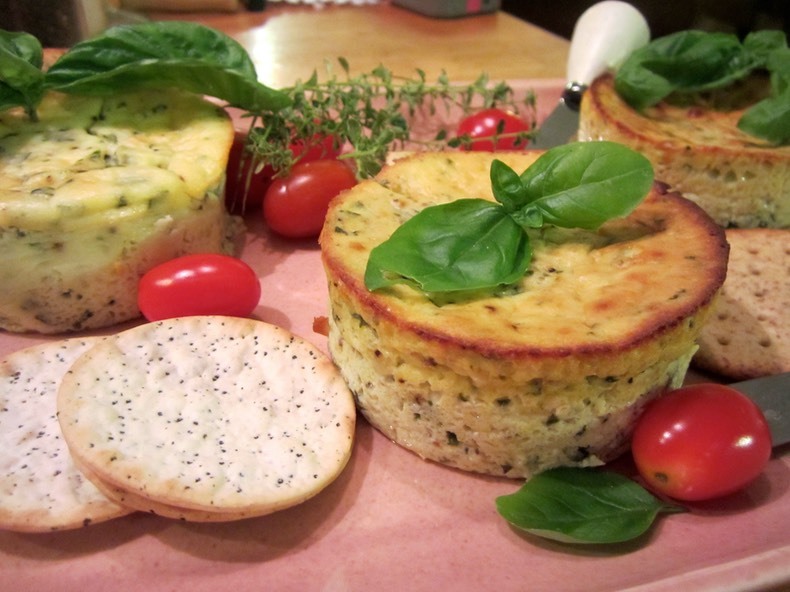 Use two 4-inch springform pans or ramekins for baking. If using springform pans, put a layer of aluminum foil around the outside to prevent leakage. Spray pans or ramekins with cooking spray. Place ramekins in a large baking dish and add about 1 inch of very hot to boiling water. Bake for 40 to 45 minutes until lightly browned. Turn off oven and partially open the oven door to let cheesecake cool for 45 minutes. Remove cheesecakes to the refrigerator to cool for 2 more hours before unmolding. Cheesecakes may be made two days ahead of time. Serve with crackers, bread, apple slices, pear slices, or veggies.